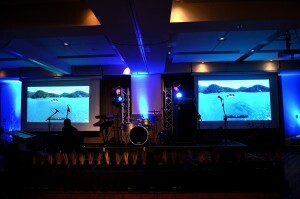 audio visual hire, av hire auckland, projector hire, projection screen hire. The Rock Factory has the audio visual hire solution for your event, for example projector hire, projection screen hire, microphone hire, speaker hire, TV screen hire, lighting hire and drape hire or curtains for your event, conference, function, prize giving or ball. 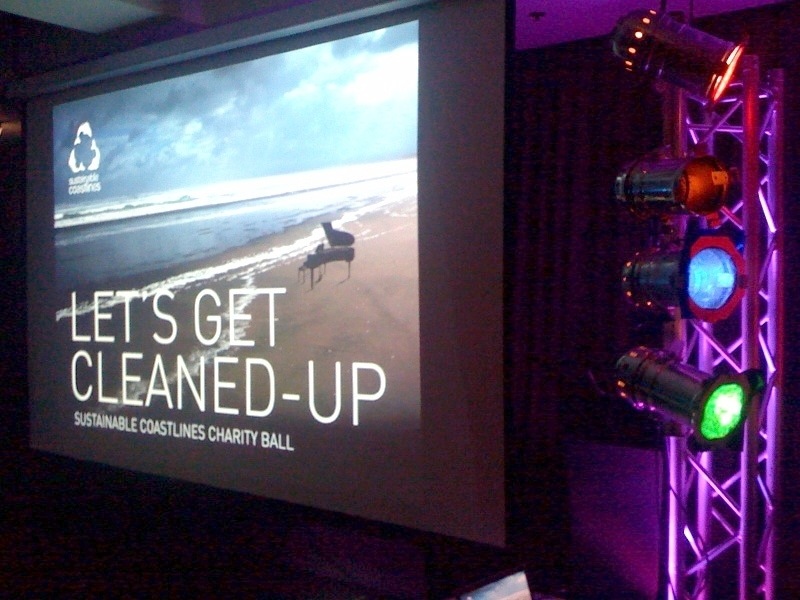 To read more about our av hire services for Corporate Events click here. To read more about our services for parties, functions and special occasions click here. Prices shown are per day rate and additional days, such as consecutive days are half price. We are you one stop place to go for AV hire Auckland. HDMI or VGA 3300 Lumens Projector hire, Panasonic – $100+GST each. HDMI Projector, 5000 Lumen Projector hire, JVC – $150+GST each. Large Front Projection screen hire 150″ (4:3 ratio) 3.05 x 2.29m (to hang from high beam bar or similar) $120+GST with clamps or $150+GST with Push Pole Frame. Large Rear or front Projection screen hire 150″ (16:9 ratio) 3.32 x 1.9m (fastfold frame – Grandview – freestanding) $150+GST we have 2, so can be put either side of a stage. We have two 150 inch free standing widescreen format screens. Can also be hung high up using pushpole frames. 100 inch Tripod projector screen $75+GST. Hire a TV, 50 inch TV Slimline LED TV Screens – Panasonic – we have 2 and they are $190+GST each to hire. TV Stand – standard black TV stand hire OR Truss TV stand hire with and TV Clamp to hang the TV $30+GST . Uplighting or wash for the walls or atmosphere – any colour: PAR 64 LED lights on floor stands or with clamps $25+GST. Architectural lighting, colour themed uplighting for balls, weddings, functions and parties. Party lighting (disco lights, lasers, dance floor lighting) $25+GST each. Lighting stands with base plate $15+GST each or lighting truss with base plate $25+GST each. Small Smoke machines $35+GST, large smoke machine, haze machine or hazer $50+GST – lighting smoke and effects. Staging, podiums or Risers – 1.8 by 1.2 meter pieces are $50+GST each, 2.4 by 1.2 meter pieces are $70+GST each. 30, 50 or 90 cm height legs available. Drapes or curtains – known as Pipe and Drape or the push pole type drapes to partition off or make you venue look classier. Can also be used as a backdrop behind a stage or to create a theatre type atmosphere. $10+GST per upright (extendable up to 5 meters high), $10+GST per base plate (to hold the uprights in place), $10+GST per crossbar (extendable to 3m), $25+GST per meter of drape – they come in 3 meter sections (flat) but look better when that is draped across 2 meters (hanging) – so hire 3 meters to cover 2 meters if you want it to look like nicely hanging curtains or drapes. $100+GST per 3 metre section including push pole frames. Clicker and laptop for your power point presentation. Wireless or cordless handheld microphones $75+GST each – Shure or Sennheiser microphones. Wireless beltpack systems with or without Lapel microphones or headset microphones are $75+GST each. Headset microphones are $15+GST additional on top of wireless beltpack system pricing, therefore wireless microphone systems with a headset microphone are $75+GST each. Additional standard corded vocal or instrument microphones $10+GST each. Additional microphone stands $5+GST each. For more lighting options click here. For more staging options click here. 2 x Powered speakers with speaker stands ($75+GST per speaker). 4 channel mixing desk ($40+GST). up to 2 x standard vocal microphones with cables (Optional extras with the speakers – NOT CHARGED!). Public address systems and AV hire Auckland for Fitness and gym audio, weddings and engagements, Exhibitions, conferences, product launches, activiations, B2B or business to business events, sporting and cultural events. For other sound system options for DJ or Band and different audience size suggestions click here. Add a cordless microphone for $75+GST each. Barstools $15+GST each (we have 9 matching barstools that look great for interviews, artists or a quiz onstage). Additional speakers for spread or Sub speakers of bottom end $75+GST each (on top of basic vocal PA above). additional stage pieces (1.8 by 1.2 meters) are $50+GST per piece. Standard microphones or DI boxes with cable at $10+GST each, microphone stands at $5+GST each. Powered foldbacks/monitor speakers (optional extra) $50+GST each. Packin and Setup OR Packdown and packout $75+GST Each way (minimum call out fee PER Person needed to lift things in or out and setup – total dependant on size of setup required and number or speakers and lights e.t.c). Vocal PA hire Self-powered speakers on speaker stands with small desk and a microphone. Perfect for conferences with speaking and/or CD/iPod music playback. Headset or lapel microphones with beltpack and/ or handheld cordless mics, a lectern to stand behind and a laptop and clicker to go with your power point presentation. Projector and screen hire Connect to your laptop, TV or DVD player. Projector hire for presentations, video releases, music videos, parties and movie nights! Pricing is for hirage per night. For multiple night hire, additional nights are half price. Audio visual hire is great for events such as conferences, speeches, weddings, functions, workshops, seminars, visuals, playing iPod music at an event, presentations, product launches, lectures etc.